Learning & Values Essentials of the Jewish Religion Building Blocks of Jewish Thought Happiness! I’m sorry I can’t make it to classes anymore. I still feel that an observant Jewish life is the right way to go, but I personally can’t handle it. Whatever I do, I feel it’s not enough. There’s always something I left out or something I didn’t do properly. I feel like Judaism has boxed me in, and I want to leave the box. When you told me that you wanted to make your kitchen kosher, I told you, “Let’s go step by step. First, start buying only kosher foods and keeping your meat and milk separate. Once you’re comfortable with that, in a few months, we’ll see what has to be done in the kitchen.” You wanted to invite people over to your house to serve them a kosher Shabbat meal. I told you to hang in there a few months until it feels right. The same with the way you dress, the prayers you say each day, the amount you study each day—I tried with all these things and more to get you to pace yourself, to move forward deliberately and steadily. Why? Because I didn’t want you to box yourself in. No, not a box, but stiff, heavy clothes; like a novice hiker, every hiking gadget imaginable dangling from an enormous backpack slung over layers of the latest in hiking apparel—and almost incapable of inching forward. I understand why you did things this way. You see others trucking along with all their mitzvah gear with apparent ease. You’re excited, and in your enthusiasm you don’t see why you should be any lower on the ladder than them. Perhaps you also don’t see why you can’t be even higher than them. 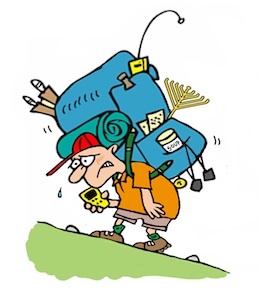 First off, let me tell you something about ladders: When it comes to keeping Torah, ladder altitude is irrelevant. It’s not how high you are, but in what direction you are moving. The guy at the top slipping down is lower than the guy who just grabbed hold of the first rung up. There’s a line in the Talmud that “G‑d doesn’t scheme against His creatures.”1 He’s not out to get you. He asks from you that which you are capable of achieving right now, according to where you’re at in your life right now. You’re not measured up against Moses or Rabbi Shimon bar Yochai or the Baal Shem Tov. You’re measured by your own capabilities as you stand, and nothing more. It’s not true. As long as he’s moving upward, at his pace, and he’s got the basics under his belt, he’s a righteous Jew doing all G‑d expects from him. It’s only when he starts to rush that he can lose that status—because by rushing, he places all he has accomplished so far in jeopardy. It’s actually a halacha: A Jew is not allowed to possess leavened bread on Passover. What if he discovers in the middle of Passover that he has some leavened bread in his house? Every moment that he is not busy getting rid of that bread, he is breaking Passover. But as long as he is involved in isolating the bread and destroying it, everything is okay. The same in your case: As long as you are on your way up, taking on whatever you are ready for step by step, you’re okay, 100%. In fact, you’re higher up than the guy who has been doing this his whole life, has every detail under his belt, and hasn’t moved upward for two days straight. He too has to be ever moving upward, with steps at least as big as yours each day. Secondly, let’s distinguish between aspirations and expectations. Always aspire for more than you can achieve. If you’re a vault jumper, aim for the highest; if you’re a speed racer, aim for the fastest. If you’re a Jew, aim to be as magnificent as Abraham your father, as pure as Sarah your mother. That’s good, that’s healthy, that’s the way you move forward. What’s unhealthy is when you start to expect those things of yourself, when you kick yourself for not being there. The aspirations are good; the expectations are pure ego. When you want your GPS to navigate you somewhere, the first thing it needs to know is where you are right now. You are here right now. You, with all your baggage; your habits good and bad, your life experiences and the attitudes they fostered; the memories that will never be washed from your mind for better and for worse; your skills and talents that must all be used now in the right direction; your wondrous imagination that can be harnessed to create beautiful things for everyone to benefit; you with all the limitations that come with life on planet earth as a human being. Celebrate every mitzvah you do, and none of them will feel like a box. The Creator of the Universe will celebrate with you. That’s all He really wants from you—to do those mitzvahs with joy, with life, with your entire being. And that’s the way you move forward, by celebrating every incremental advance like a toddler celebrates his first steps, the way you felt when you first rode your bike without training wheels. What’s the point in amassing mitzvahs like a dealer shark buying up the market, if none of them become part of who you are, like a good shoe molds itself to your sole? It’s that savoring, that celebration, that’s how all this sinks into your bones. That’s how you gain ownership of your new way of life, so that you can build from it a beautiful home and family. Then there are no boxes, only more and more cause for celebration. Let’s work out together a reasonable plan. We’ll work out what you should be doing right now, and what you should not be doing—yet. Let’s talk basics: basic rules of Shabbat, basic kosher eating, basic issues between husband and wife. Let’s start all over again, this time for real. Torah doesn’t expect you to take on everything at once: Likutei Sichot, vol. 35, page 65. See Should I Regret My Past Life? Doing mitzvahs with joy and not torturing yourself: Better Happy Than Strict ;Better Smart Than Sad ; Medicine As Sweet As Honey Can Judaism Be Fun? Why Did G-d Give Me Depression? Thank you, Rabbi Freeman. You have said it all. Take me for example. I was brought up to keep what I thought was strict kosher. Separate dishes, the whole nine yards. I learned that this was not enough. I needed to do more than read the ingredients. I needed to look for a heksher (for example, a U with an O around it) to be sure it was truly without any nonkosher ingredients. I learned that keeping Shabbat meant more than going to services. It meant that Saturday afternoon should be spent learning Torah or enjoying a leisurely lunch with other Jews, or even taking a nap, rather than going shopping or to a movie. Each time I learned something, I took a baby step. My first step was to stop using money (or credit cards) on Shabbat. My next step was to avoid working at my job on Shabbat. That was scary. I was afraid I would get fired. I was still doing other work on Shabbat. My next step was to stop eating chicken at nonkosher restaurants. Then all meat. Then, anything at such restaurants. In a box? Dear"Boxed IN"
The mere fact that you discovered the Emet in and of Hashem through Judaism is a huge wonderful blessing!! I am in my now early sixties and it took me since the age of sixteen when I was so close to your discovery and missing it felt devastating to me at first. I was always so close to understanding what you have now. I, as Noahide woman, who yearns to convert to Judaism face similar obstacles as yourself. I had to slow down myself because my ego was quickly the best of me. Please, know you are not alone on your journey. Laughing becuase that's the way I use my app... Long story how this started, but the short of it is that I'm using an app/web site to help me with my daily habits. One set involves moving up the Jewish ladder. It's very useful, and one reason is that I started with just a few things. As those things became habits (turned green/blue from repeat performance), I stretched the goals (more pushups, more Jewish study), or added a new item. It's working very well so far. And today, "Jewish Study Prayer 2x/day" kick-started me to come to Chabad - where I found this article! This was a wonderful article. I remember when I realized my Jewish roots, in 1976, and went to Synagogue study group for the first time, how intimidated I was. I felt like a burden because I had to rely heavily on interpretation from Scholars who wizzed all around me. Deep and supernal meanings made me feel like a ship that ran upon land. Yet I stayed with it. Because of my love for the Great and Holy One. Today I am fully entrenched in Torah, coated in the beauty of its wisdon, with a full understanding of the Great and Holy One, Blessed be He. It was the one step at a time that I took, like a baby taking their first steps. I was tenacious and flourish now with the love of Torah and the numerous teachers I have been blessed to know who assisted me greatly on my journey, because of their love for the Great and Holy One. Change with inner or spiritual growth is what "seals the deal". Change that is mechanical has value but doesn't usually bring permanent life style change. I too am making my way to Torah Judaism. The lighting of Shabbat candles, saying Modeh Ani in the morning and am ready for Havdalah. Buying and eating Kosher...searching websites for where I can purchase Kosher products takes time and time is what it takes. Just letting you know that there are others moving 1 step at a time. Climbing that Ladder I love this advice in general and how it is explained at different levels. Re: too much (Jacob Winkler) G-d forbid to drop any good mitzvah or custom you've already made part of your life. But once you start doing, start learning about what you are doing. The Jewish people said at Mount Sinai, "We will do and we will listen." After you start doing, then comes the listening--listening to what you are doing.